God First since 1899. More than a century later, Azusa Pacific remains committed to the vision on which it was founded—preparing disciples and scholars to go out and make a difference in the world for Christ. Azusa Pacific University, one of the largest Christian universities in the nation today, began on March 3, 1899, when a group of men and women passionate about creating a place for Christian education gathered to form the Training School for Christian Workers. 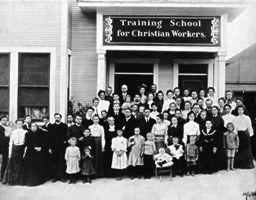 It became the first Bible college on the West Coast geared toward preparing men and women for ministry and service. Meeting in a modest home in Whittier, California, and led by President Mary A. Hill, the school grew to an enrollment of 12 in its first term. The early years of growth saw the school relocate and change leadership several times. 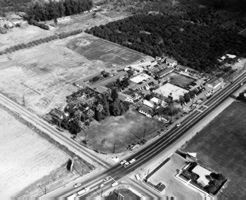 Then, following mergers with three Southern California colleges, the university relocated in 1946 to the city of Azusa, where it resides today. The mergers and early growth of the university brought great strides, as well as great challenges, and yet the focus on the school’s core vision never wavered. In 1939, Cornelius P. Haggard, Th.D., became the school’s 13th president. Haggard’s early years as president were fraught with adversity—enrollment was down and donations from the prior year totaled only $27. Among his many accomplishments, Haggard launched a variety of innovative fundraising efforts, including the annual Dinner Rally that continues today. He traveled the U.S. to raise resources for the school, always trusting God would provide a miracle to meet the university’s needs. Haggard served for the next 36 years, achieving many significant milestones along the way. After Haggard’s death, Paul E. Sago, Ph.D., became president, serving until 1989. Among his many accomplishments, Sago encouraged the development and growth of off-site educational regional campuses throughout Southern California, and presided over the addition of master’s degree programs and the development of schools within the university. Richard E. Felix, Ph.D., became president in 1990. Felix played an instrumental role in initiating the university’s first doctoral programs. He also reframed the university’s values as Four Cornerstones—Christ, Scholarship, Community, and Service—and oversaw the construction of seven new buildings, a doubling of student enrollment, and the quadrupling of graduate programs. In November 2000, Jon R. Wallace, DBA, an Azusa Pacific alumnus and former student body president, assumed the role of university president. Prior to becoming president, Wallace served in numerous roles at the university, including dean of students and vice president. Known for his passion, energy, and connection with the campus community, Wallace began building upon the legacy of his predecessors and envisioning the next level of God-honoring excellence for APU. His entrepreneurial approach to management, program development, and meaningful, transformational scholarship has led the university through a period of growth, including overseeing completion of several new buildings, including the $54 million Segerstrom Science Center, the most fiscally significant project ever undertaken by the university. Under Wallace’s leadership, and working closely alongside the Office of the Provost, APU continues to advance its commitment to comprehensive, relevant scholarship through the development of rigorous academic programs and recruitment of high-caliber faculty. Most recently, graduate program offerings increased through the addition of the Online Master of Arts in Modern Art History, Theory, and Criticism and the Doctor of Nursing Practice. At the undergraduate level, the merger of several departments into the College of the Arts, as well as the new Honors College, provide students with enriched academic options. Study abroad programs have also grown with the addition of the South Africa Semester alongside more than 40 other national and international study opportunities. 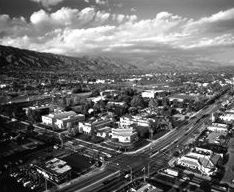 Looking to the future, in 2012 Wallace announced the Shared Vision 2022 for Azusa Pacific, grounded in the following vision statement: APU will be a premier Christian university and a recognized leader in higher education, a city on a hill that reflects the life of Christ and shines the light of Truth. The vision focuses on four key components: advancing APU’s Christ-centered mission, enhancing its academic reputation, continuing to value people, and pursuing financial excellence. Today, APU offers 61 bachelor’s degrees, 45 master’s degrees, 24 certificates, 12 credentials, and 8 doctoral programs to more than 10,000 students at the university’s main campus in Azusa, six regional locations, and online. The university earned a 9-year reaccreditation from the Western Association of Schools and Colleges (WASC) Senior College and University Commission in 2013, and holds 13 other specialized accreditations. The university’s award-winning intercollegiate athletics program consists of 19 teams. The program won an unprecedented eight consecutive National Association of Intercollegiate Athletics (NAIA) Directors’ Cup awards before beginning provisional membership in the National Collegiate Athletic Association (NCAA) Division II in fall 2012, becoming a full member in 2014. APU also belongs to the Pacific West Conference in all sports except for football, which belongs to the Great Northwest Athletic Conference (GNAC); women’s water polo, which belongs to the Golden Coast Conference (GCC); women’s swimming and diving, which belongs to the Pacific Collegiate Swim and Dive Conference (PCSC); and women’s acrobatics and tumbling, which belongs to the National Collegiate Acrobatics & Tumbling Association (NCATA). Through all this, Azusa Pacific continues advancing its core mission, preparing and graduating students who go on to make a difference in the lives of others. Learn more by watching the stories of alumni like these as they carry on that tradition while inspiring future generations.